What’s better than receiving dividends every quarter? Well receiving a larger dividend of course! Most companies I own have a track record of raising their dividend each and every year at a rate higher than inflation. Philip Morris (PM) on 06/08 announced surprise news. 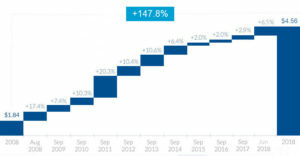 From PMI.COM: PMI has increased its annual dividend every year since becoming a public company in 2008, representing a total increase of 147.8%, or a compound annual growth rate of 9.5%. In fact PM just announced a surprise increase in June raising their dividend to 1.14 from 1.07 or 6.5%. They typically raise it in September. So I’m not sure if this raise was following the footsteps of MO where they also increased early. The difference is I expect MO to raise again later in the year, PM I’m not sure. Shares were up recently on the news. I believe the company is a SCREAMING buy though, Morningstar agrees with a 5-star rating. The new dividend is $1.14 from $1.07 (6.5% increase) payable 07/11/18 to shareholders of record as of 06/22/18. I currently own 474.97 shares of PM (8.8% weight) and this will increase my yearly dividends by $132.99, that’s over $10/month! Pepsico (PEP) Announced a dividend raise on 05/01. I know I’m a little late to report but I’m catching up from May. The new dividend is $0.9275 from $0.805 (15.2% increase) payable 06/29/18 to shareholders of record as of 06/01/18. I currently own 40 shares of PEP (1% weight) and this will increase my yearly dividends by $19.60. Cardinal Health (CAH) announced on 05/09/18 a dividend increase of 2.9% to $.476/share quarterly. I was honestly just happy to see a raise with everything going on their business right now. The new dividend is $0.476 from $0.462 payable 07/15/18 to shareholders of record as of 07/02/18. I currently own 109.35 shares of CAH (1.4% weight) and this will increase my yearly dividends by $6.12. I’m also looking forward to increases from GIS (estimating .01 to .50 quarterly) and MDT (estimating .04 to .50 quarterly) in June. That’s a total of $158.71 in annual increases for just being a loyal shareholder. Indeed! Not a bad thing at all. Overall, a good list of names providing increases for you. PEP, in particular, has gotten a lot of mention lately due to the nice increase. I love some PEP, i need to add more capital to buy some more. So many companies are looking attractive though and I never can buy as much as I want. Yes, the increase was pretty amazing. Woah. Those increases had a very nice impact for you. The PM one caught me by surprise and I was shocked about the size of the increase given everything they have gone through. Luckily, I own all three companies on your listing. I loved that PM dividend increase. That was very welcomed.